A 32 year old man with a history of HSV keratitis presents with injection and sensitivity to light. He was started on topical antibiotic drops by his primary care provider, but symptoms did not improve. He was then seen by his optometrist who started oral acyclovir and durezol and promptly sent him for evaluation. On examination, his vision was 20/30 OD, 20/20 OS and his IOP was 15 and 19 respectively. On slit lamp exam his cornea was clear bilaterally, but there was 2+ cell and 1+ flare in the right eye. The left eye was quiet. The iris and lens were normal OU. He had 1+ cells in the anterior vitreous of the right eye while the left eye was normal. Figure 1. Fundus exam of the right eye demonstrating retinal whitening in the superotemporal. There was also mild whitening in the inferior retina (not visible on photo). The patient was switched from oral acyclovir to oral valacyclovir 2 gram TID. Durezol was continued every two hours. He returned for evaluation two days later. At that time there was no improvement in the retinal whitening and the decision was made to proceed with AC tap and intravitreal injection of ganciclovir. At follow up 3 days later the results of the PCR for HSV-1 were positive. His retinal whitening was also improving at that visit. Acute retinal necrosis was first described in 1971 by Urayama et al. as a bilateral necrotizing retinitis. Over the years the syndrome has been recognized as occurring as unilateral or bilateral and is described as acute onset of episcleritis or scleritis followed and anterior uveitis and subsequent vitreous opacification, necrotizing retinitis and occasionally optic neuritis. The retinitis is characterized by multiple yellow-white lesions, which typically begin in the peripheral fundus, and eventually become confluent and spread toward the posterior pole. There is typically a vasculitis, which causes perivascular sheathing and even obliteration of arterioles. The retinitis can lead to exudative retinal detachments during the active phase. Once the lesions resolve (after about 4-6 weeks) the affected areas usually pigment and leave a scalloped appearance to the border of the remaining retina. 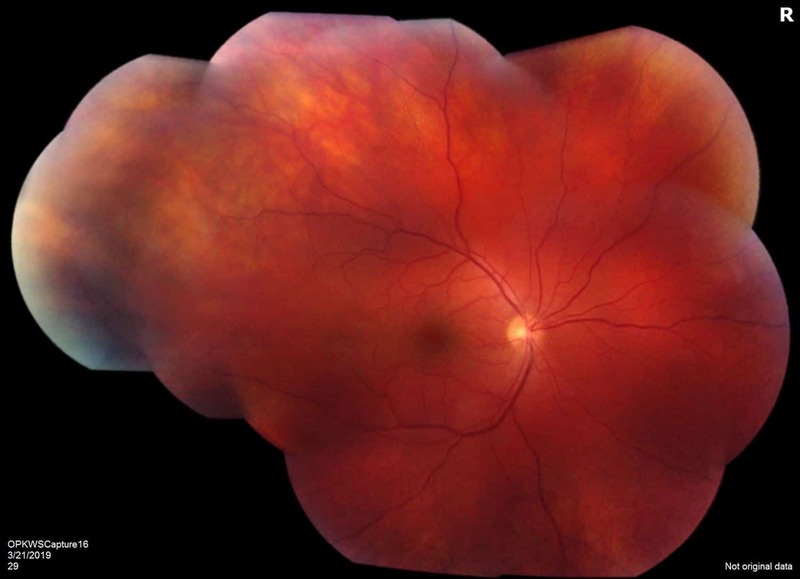 There is a 75% risk of rhegmatogenous retinal detachment 1-2 months after the onset of retinitis in untreated eyes. These patients can also develop meningoencephalitis. The etiology of ARN is a viral reactivation of either VZV or HSV. VZV is the most commonly isolated virus, although HSV may portend a higher rate of concurrent meningoencephalitis. Untreated, only 28% of eyes typically reach a final vision of better than 20/200. With treatment however, less than 1/3 of eyes will develop vision worse than 20/200. Eyes affected by VZV may have a worse final visual acuity owing to a higher rate of retinal detachment. While patients with ARN were typically started on IV acyclovir induction for up to 14 days, patients can now be safely managed as an outpatient with oral valacyclovir up to 2 grams three times a day. Intravitreal gancyclovir and foscarnet have also been used and show promise in reducing progression of the disease, especially in patients who continue to worsen despite systemic therapy. Some small studies have suggested that combination systemic and intravitreal antivirals lead to reduced risk of rhegmatogenous retinal detachment and better final visual acuity2. 1. Venulakonda, A et al. (2018).Actute Retinal Necrosis. In Ryan’s Retina (6th ed.,). Philadelphia, PA.
2. Shantha J.G., Weissman H.M., Debiec M.R., Albini T.A., Yeh S. Advances in the management of acute retinal necrosis. Int Ophthalmol Clin. 2015;55:1–13.